Katie Wilkinson was four when she binned ballet classes to follow her twin brother Ben to football training and continue their sibling rivalry on a new stage. It is a rivalry that has helped Katie build a burgeoning career with Aston Villa Ladies and earn international recognition with England's Under-19 team. While exact scores of fiercely-contested garden encounters have been forgotten, the really important numbers are recited like title wins. Ben was born 30 minutes earlier, but Katie quickly and proudly declares she weighed 13oz heavier than her 6lb brother. "Through and through I've always been better than my brother - always," Wilkinson told BBC Sport. "He was scrawny and came straight out, while I ate all the food and came out beefy. "It has always been that if I did one thing, he would want to do it better and vice versa." After finally convincing their mother Lorraine and father John that Tuesday dance classes with older sister Olivia were not for her, Katie joined Ben on the football pitch. "I wanted to go with my twin brother," said Katie. "I used to do ballet and tap on Tuesday nights with my big sister for four hours and I hated it. "My dad wanted to keep me and Ben together in the same team, which I appreciate, because we worked really well together and got the best out of each other." For five years, they strived to outshine one another on the pitch. While Katie was being introduced to the game with Aston Villa, Ben was attracting the attention of Derby County and signed for the Rams as a nine-year-old. And yet, their rivalry continued. 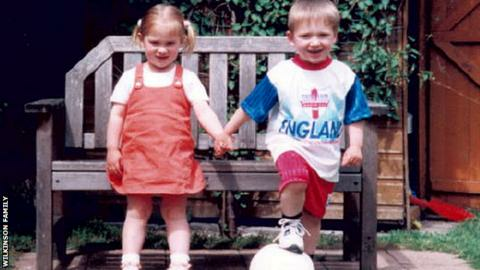 "We played football together all the time in the garden, which my mum wasn't a massive fan of," Ben said. "From day one, it has always been a competition between us. I'll be honest, she has beaten me loads of times and I'm not afraid to admit that. "That competitive edge helped us progress and get better and better. I didn't think anything of it being Katie, my sister, because it was always good to have someone of a similar standard to me that I could play football with. "I never had to go to a friend's house when I wanted to play, I just had to knock on my sister's door." While his own career never reached the heights that he had dreamed of, Ben is proud of what his sister has achieved. "I'd like to say I've played some part in getting her to where she is today," added Ben, who continues to play non-league football with Boldmere. "I'm still enjoying football, but not playing at the level that I wish I was. I have played at a good level and with some very good players who have gone on to make it. "It is such a small percentage of player that makes it and at least one of us has made it and represented England as well, which I'm very proud of. "To go to a game on a Sunday and see 'Wilkinson' on the back of her shirt is something I never thought I'd see." As Ben has been watching his sister rise through Aston Villa's ranks over the past 12 years, he has also seen the women's game transform. He said: "It has come on in leaps and bounds the past four or five years, with more money involved and the game attracting a lot more spectators." Nowhere is the evolution of the women's game clearer than at Villa, with the side founded in 1973 as Solihull FC going on to establish a relationship with Villa in 1989, before being officially integrated into the club in 2007. Last year, they were one of 10 founding members of a new second-tier competition - Women's Super League Two. Katie's rise has reflected that of the club's, and she hopes to play a key role in winning promotion from WSL 2 to the top flight. "To be in WSL 1 would be class," she said. "The difference from when I first started, when I was eight, to now is absolutely massive. "When I was in the under-eights, I was wearing a second-hand kit that had claret down one side and blue down the other, the most minging kit you have ever seen in your life. "From minging kit, we have gone to something we are proud to wear."